The specialist show designer Tom Postma, the genius behind art show TEFAF, among others, tells FX about the challenge of art object display. The European Fine Art Fair, better known as TEFAF, is held every March in Maastricht (think NEC with better cafes). Enormous though it is, the fair is a world leader because of the extraordinary quality of the items on sale. Top of the market art and antique dealers across the world save up their finest museum-quality objects for exhibition and sale at TEFAF. TEFAF prices can be stratospheric – six figures and beyond. Hedge-fund managers and Russian oligarchs, or their advisers, might come here to decorate houses. Old money connoisseurs and museum curators, though not as prominent as they were, come to fill gaps in their collections. Few residential designers will be able to buy for their clients on this scale, but they might also come to gather ideas and inspiration. 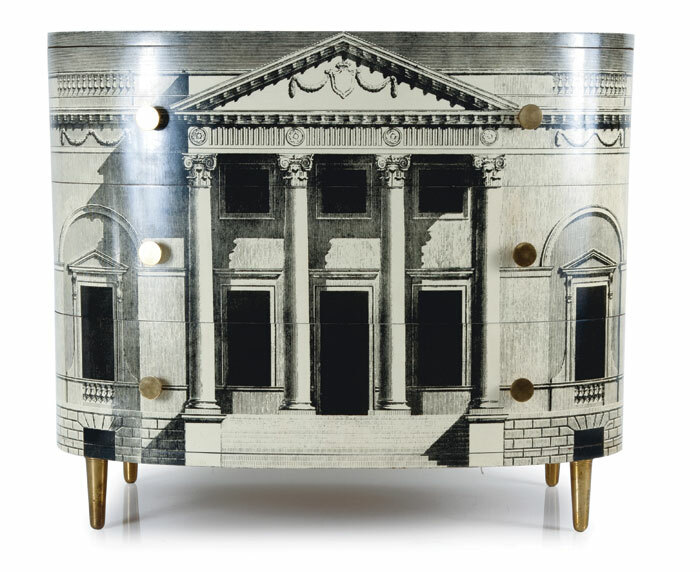 Many exhibitors open up new residential design possibilities in their carefully planned display of objects drawn from different periods and cultures. Ancient Roman and modernist sculpture might be seen together, or tribal art and contemporary ceramics resonating with each other, suggesting new combinations of texture, colour and materials. Tom Postma is the designer for TEFAF and an international leader in art exhibition design and museum architecture, and is also involved in residential interior design. Here he shares insights into the challenges of art object display and how he transforms the interior of the TEFAF venue MECC into a breathtaking city of art. FX: How is designing for a fair different from designing a permanent structure? Tom Postma: The big advantage of designing for a fair is that, because the structure is temporary, you have the option to make changes each year, do something different. Novelty is a strength and a necessity of fair design. It’s not a fixed situation, so you can find new says to tickle people and create a buzz. At this year’s TEFAF the entrance was totally different to last year. Novelty and surprise are very important, that’s what people expect. The people who visit art fairs are very visually aware, so it’s essential that the design of the fair looks good and keeps evolving to hold their interest each year. And of course you have different art fairs with different visual expectations. TEFAF is different to Art Basel, Art Basel in Asia (Hong Kong), or Miami Beach, which I also design. With Art Basel you have a really contemporary atmosphere, it’s all about the art of now, but TEFAF is a fair that goes all the way from the prehistoric to the contemporary. So, here you need the architecture to look a bit more timeless, try to make it not too specific to any particular period. But with any art fair, Art Basel included, what’s most important is that the architecture should never compete with the art. How do you achieve that without making the architecture so neutral that it becomes bland and a bit boring? The architecture can be dramatic and make a strong statement where it’s needed. 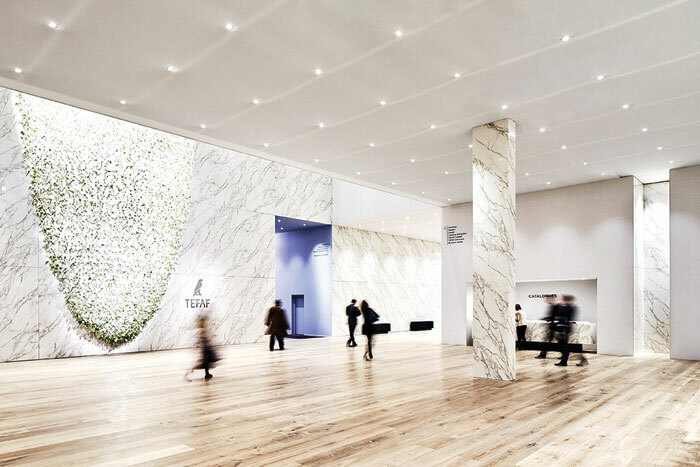 For example, at the entrance at TEFAF we had a crazy 10m-high wall of marble – it made an impact. The main thing you want to achieve in an art fair is to let the art stand out, let the art create the main visual interest. The most important thing for that is light – good lighting. Like the architecture, the lighting should never try to compete with the art; it must subtly showcase the art and not scream over it. But I know how to individualise each exhibition stand by the use of light, while at the same time showing the art to best advantage. Individualisation is very important because you have hundreds of stands and you must have variety. I was an artist, I understand what it is to have a gallery and that it must offer an interesting spatial experience that isn’t just neutral. I think the reason why they ask me to work on art fairs is that I know how to hang a painting and what makes a gallery interesting, because I’ve designed my own exhibitions and gallery spaces. Light is the key. Peaceful, indirect lighting that makes you aware of the art, not the light source. There’s a real revolution in lighting going on, with LED lighting and so on. People understand more and more how important lighting is. What we do here at TEFAF is a state-of-the-art museum approach to lighting. Museums are really catching on to the possibilities of how to use these new lights to improve the display of art and objects, how to place your spots so that you avoid glare – that’s absolutely critical. Lighting has developed so fast – the lighting in museums designed only 15 years ago is very bad by modern standards, though at the time we thought it was great. Now every spot you can shape, focus or dim individually; there’s a revolution going on there. One of the good things about a new structure like an art fair is that you can always adopt the latest lighting technology if you can afford it. Lighting for the museum world is very specialised. At Zumtobel, for example, there are engineers who only work on art gallery lighting; they are very good. Erco is also good in this area. But the thing is that the family owner of Zumtobel is a big art collector and he really cares about lighting for art. Lighting might be key, but what is the role of the structure, the physical architecture of the fair? The architecture provides the city plan, essential to a good fair. In the plan, you have grand boulevards interrupted by squares, areas where you can rest, have a tranquil moment to decide ‘Should I buy it or not?’ TEFAF is really the best for what I do in the city planning of a fair. It looks simple, but this is the most important part of the whole thing, to create a floor plan that makes every stand in the corners feel visited – there are A and B locations for exhibition stands, but no-one should feel that their location is C or D.
That takes the most time of the whole design – it’s to do with the layout of the squares, the width of the corridors. Figuring out what makes people go somewhere, we’re fascinated by that. The key reason why people ask my firm to do the most important fairs is that we really understand how to make this temporary city of art work well. What’s very important to a fair is that you should have the feeling that there’s an inside and an outside. The stands are the shops and the corridors are the streets, and they must have the feeling of outside. That’s why I make the ceilings of the corridors so high, and they have cooler, flatter lighting. We keep the street calm and tranquil, separate from the visual excitement of the stands. When you step out of the stand, the shop, you must feel you are back in the street, the public area. Do you impose any rules on exhibitors as to what they can and can’t do with their stand designs? Absolutely! At TEFAF, I set a lot of rules and I’m out with my team policing them! Paintings on the outside of stands have to be below a certain size, spotlights mustn’t intrude into the street space. And there are specific rules as to what exhibitors can do inside their stands. If they’re really bad, we tell them to make changes if they want to come again next year. If one person in the city makes a mess, it spoils the neighbourhood for others. Some stands are very ambitious in their design. You have different approaches. Dealers in Old Masters tend to go for a very simple, clean, classic presentation, but that doesn’t work for everyone. 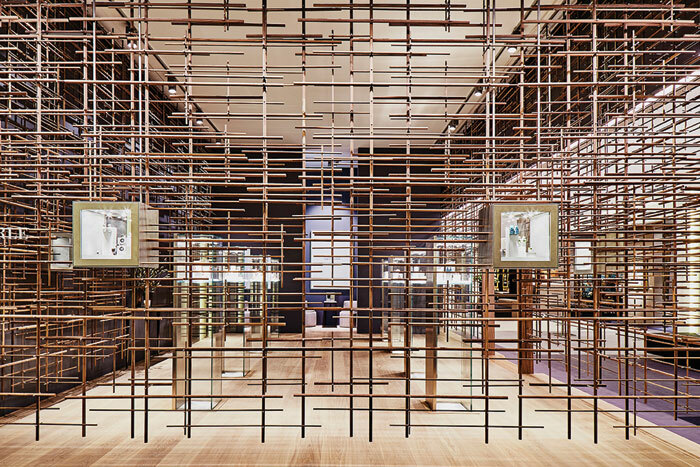 For example, there’s a jeweller, Hemmerle, I designed its stand – the walls of the stand are an open lattice of wooden rods, quite different and eye-catching. A jeweller has secure showcases, boxes in a box, with very small items on display, so you have to make the stand itself a spectacle to attract people in, you have to shout a little louder. But with Old Masters you have much more direct attraction from the objects themselves. The painting is on open display and is large enough to call somebody in from the street. What happens to the structure of a temporary fair after it’s over? Does it all go to waste? Is there a concern about sustainability? I get a lot of questions about that. What happens at TEFAF is that we have reusable systems to build the walls and the corridors, it all fits in trucks and goes into store to be reused next year. Carpets we give to social housing projects as much as possible. But of course there’s still a lot you can’t reuse. Realistically, a fair is not the most environmental-friendly thing, but we’re getting more and more aware of that, trying to reuse more. Are the principles of museum and gallery design transferable to residential interiors? You should not bring museum design into a living space. A good designer understands his client and how space is used. A kitchen is not a museum and in a living room there needs to be cosiness. But I’m afraid there are people with a lot of money and not too much aesthetic knowledge – the new rich – who buy a lot of art and want to create a museum in their homes. That’s a mistake. I know of a very wealthy man who thought of himself as an art collector – he had an adviser who helped him to buy some good stuff. Then he bought a 100m-long yacht, and he said to me ‘OK, you make it like a museum.’ I said: ‘I can’t do that, it’s a ship.’ Not only was it shaped like a ship, it was full of expensive carved wood and big decorative features that would compete with the art. Do private collectors have the tendency to show too much; everything in their collection? That’s always a big problem. Also a problem for fair exhibitors – they ask me ‘Is this too much?’ and I say ‘Yes it’s too much: 10 per cent of that is still too much!’ But it’s not always true that less is more. Sometimes, in residential design I do a wunderkammer – a concentrated display of many objects. But the trick is to balance the wunderkammer with something else – don’t make a wunderkammer everywhere. Create one area that draws people in. These are architectural principles: rhythm, balance. Is the security and conservation of fragile art objects a problem in residential design? I’m afraid sometimes people don’t know what they’ve bought and then bad things can happen. A lot of the designer’s role here is education. I have some beautiful clients, some people are very open to discussion about conservation and how to keep things from being damaged – others are not. They should have bought a Ferrari! Yes, of course! But I’m an architect and architects don’t make money; I never make enough money to buy major art. I have a collection of contemporary art, but it’s an emotional collection. I have a lot of artist friends, and I try to buy a small piece from them every year. Of course, my education included Old Masters, and I love them; but I just can’t afford to buy, and I’m too busy to find them. My wife collects contemporary art also. If you come to my house it’s full of art…but not too full!